FY5KE is located on a 2500 sq. meters lot in the leisure zone of the CSG (European Spaceport) in Kourou. There are now six towers 14m, 18m, 21m, 21m, 24m and 30m high. 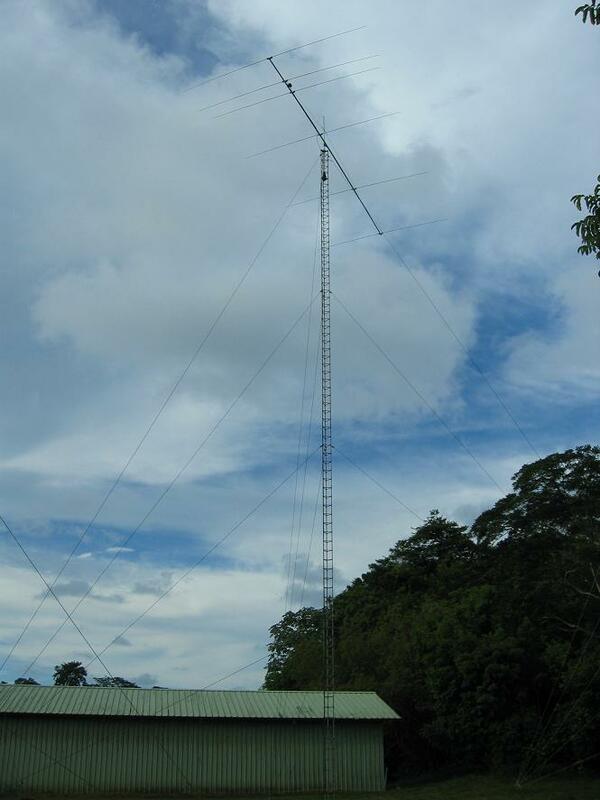 New 40m band tower during the CQWW SSB 2013. A 3 elements mono-band DX-BEAM has been plugged at the top of a new 30m high tower. 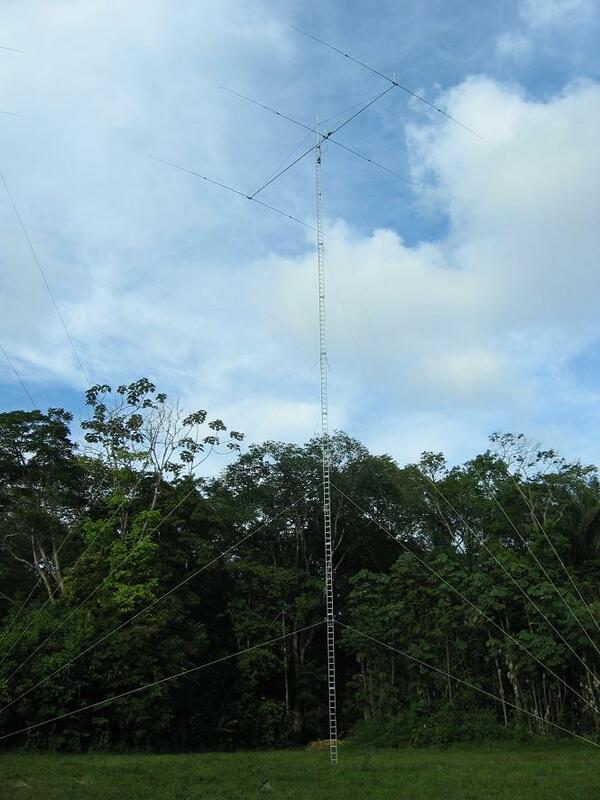 New 20m band tower during the CQWW SSB 2013. A 5 elements mono-band DX-BEAM has been plugged at the top of a new 24m high tower. 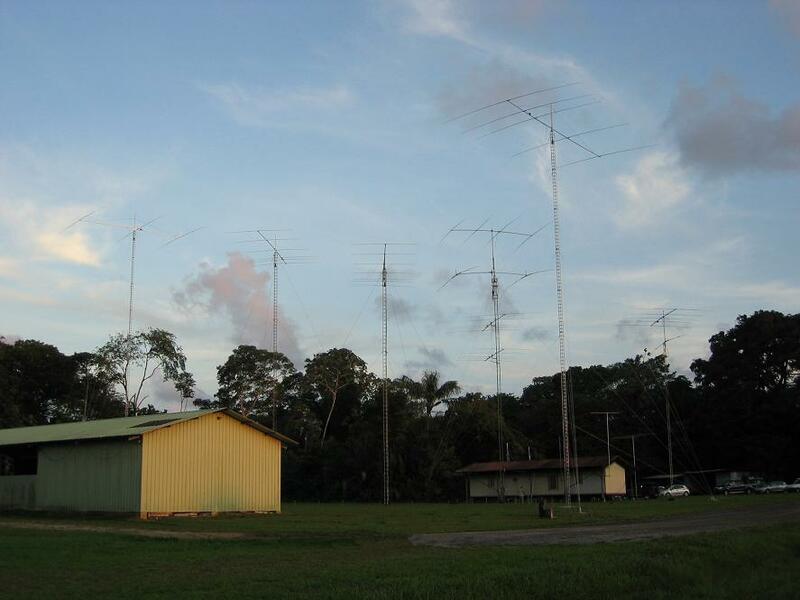 New 15m band tower during the CQWW SSB 2013. A 6 elements mono-band DX-BEAM has been plugged at the top of a new 21m high tower. Replacement of our 10m band tower during the ARRL DX SSB 2013. A 7 elements mono-band DX-BEAM has been plugged at the top of a new 18m high tower. Replacement of our Shunt fed tower 160m by a 27m Titanex vertical for the CQWW SSB 2009. New Computers with LCD Monitors and ELECRAFT K3 replacing our old TS850s. Replacement of the 3 EL Quad by a 5 EL Monobander for the ARRL DX 2005. 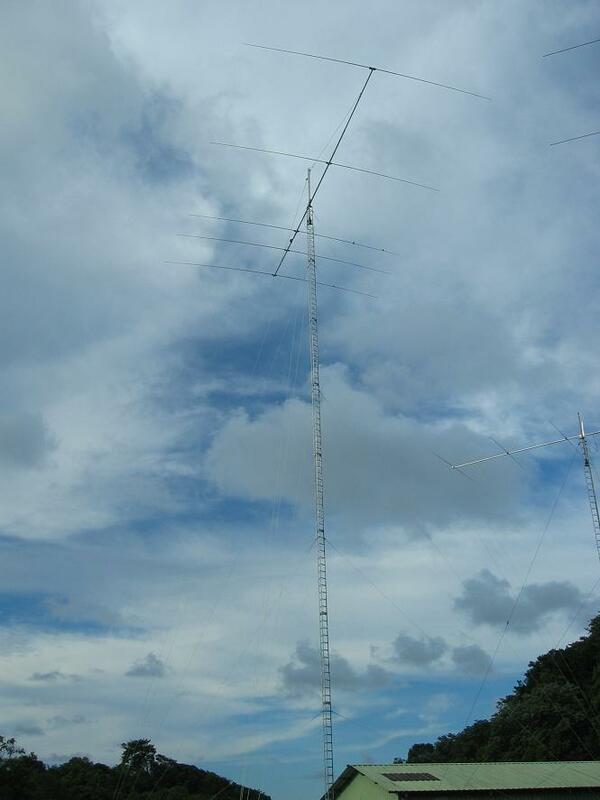 Replacement of the sloper 80m by 2 elements Vertical Phased Array for the CQWW DX 2005. The first M/S effort at FY5KE was the CQWW DX SSB contest in 2000. Only multi-band antennas (FB-33 and GPA-30) and single dipoles were used, no Beverage ! ! It was only a first and amazing experience on the DX side of the pile-up. After 1 year off, we came back in 2003, and worked hard to improve again the FY5KE station. We specially enjoyed the low bands with our new 6 beverages system, each of them being possibly listened by every operating position. RX : 6 beverages (2 for US, 2 for EU, 1 for JA, 1 for AF). The station is fully assembled before the contest and totally unplugged after the contest. A lot of cables to connect ! ! The 1st running station with a TS-850 (Dru2-equipped) with OM7ZZ microHAM micro band decoder, ICE and home-made switchable filters and AL-1500 amplifier. The spare running station (also Mult3 station) is also granted with a TS-850 with OM7ZZ microHAM micro band decoder, MFJ-434 DVK, ICE and home-made switchable filters and AL-1500 amplifier. The In-band multiplier station, with home-made W3LPL style RX switchable filter, is located in the middle of the 2 running positions. The first real M/S effort at FY5KE was the CQWW DX SSB contest in 2000. At that time, the RACK (Radio Amateurs Club of Kourou) was owning a single 386 MS-DOS machine with a 15-inch monitor. Marc F1HAR and Hervé F5HRY brought their own laptops from France, and the local members dismantled their own stations to give their screens and/or keyboards for the contest duration. FY5KE was using the current version of CT, and serial networking was a real challenge ! No integrated packet, no controlled radios. They call it “the stone age”. Later on, during the next CQWW SSB 2001, a DX Cluster access was provided by an UHF link with Didier FY5FY’s home where a dialup gateway was installed. CT was still in use, and Olivier F5MZN was finally mastering the Ethernet network. The CT stability was so-so, but no other serious alternatives were offered at that time. We even developped some CT add-ons to ease the French keyboards use. The ARRL DX SSB contest 2002 was the last contest CT was used. For this contest, we brought from France one or two cheap computers (PII 266), screens, and accessories, dedicated to remain at FY5KE station. CT has always been used by the team members for years. We all learned contest logging with CT, and used it in various locations like TM5C (ex TM1C), TM2Y, TM1W, CT8W, etc… Ken’s tool was a reference for all serious contesters, but even if Windows was more present in modern computers, we were a bit disappointed that the coming versions were still running under MS-DOS or in a console window, and there were no major improvements planned, especially for M/S teams like ours. In the meantime, Olivier F5MZN (the DX Cluster DXNet author), began to code from scratch a contest logging software in C++, for all Win32 OS : Win-Test was born. All team members were always asking for more features on CT, but unfortunalty, even if CT became freeware, it was not open source, and we could not add anything significant to it. Olivier F5MZN decided to write a new contest software adapted to our needs : Win-Test. After several coding attempts, the first version of Win-Test was privately out and used for the ARRL DX SSB contest 2003 . In the meantime, we sent few more computers in French Guiana by mail, and we brought screens and accessories with us. Even if small bugs appeared, we didn’t suffered any major crash and never had to reboot during that contest. We even won the World M/S category. Not so bad for a first try…. Olivier wanted to keep the CT ease of log navigation, and also used most of its keyboards shortcuts. We then decided to share Win-Test with the contest community for a modest fee. Along the time, many features were added. In mid-2003, Laurent F6FVY learned C++ the hard way, helping Olivier developement turntime. Marc F1HAR and Hervé F5HRY wrote and maintained documentation and quickstart guide on the web site http://www.win-test.com). Amongst other individuals and contest teams, the IARU Headquarters French station TM0HQ also uses Win-Test in a WAN (Wide Access Network) setup across France since 2003 during the IARU Championship. The Theory … And the reality ! All radios (TS 850) are interfaced with Win-Test, with home made or MicroHam band decoders. The running stations sound is recorded in MP3 on their respective computer. MFJ-432 voice keyers are also interfaced with Win-Test. 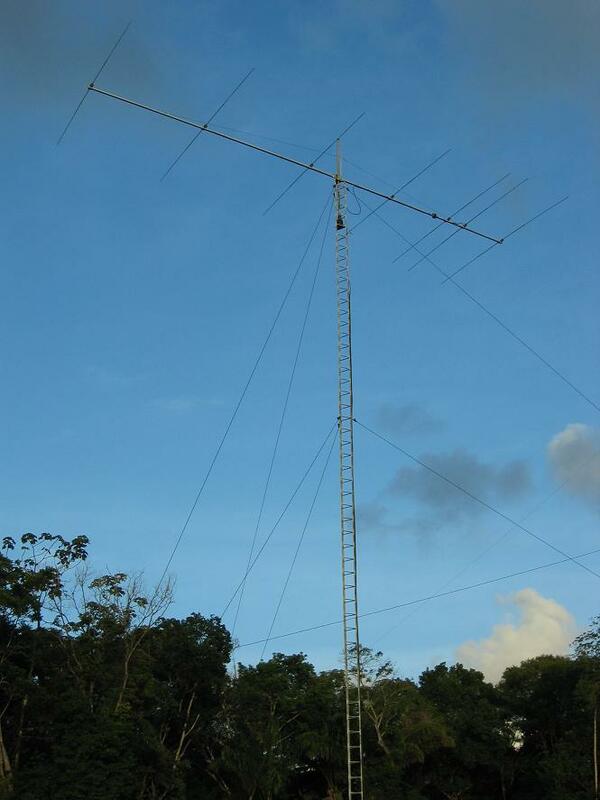 We intend to replace our 15m band tower by a new 20m High with a 6 elements DX-BEAM monobander plug on it.